We've already seen the iSight indicator light "disappear" behind the bezel of Apple's MacBook and iMac computers. A recently published patent application could make the iSight itself not only disappear, but move to the middle of the screen. MacBooks, iMacs, and even iPhones and iPod touches could take advantage of the new technology. Submitted in July 2007, the filing details plans for a camera mounted behind a display that could capture an image "while the display elements are in an inactive state (in which the display elements are darkened and at least partially transparent)." According to the document, a similar, additional system could involve two or more cameras, with software combining the two images into one. Video would also be possible by cycling the display "between the active state and the inactive state repeatedly." However, this doesn't necessarily mean a 'dark spot' would appear on the screen during photos, or even start flashing during video capture. "In some embodiments, the mechanism is configured to substantially minimize the period of time in the inactive state to reduce the appearance of flicker of the display screen." 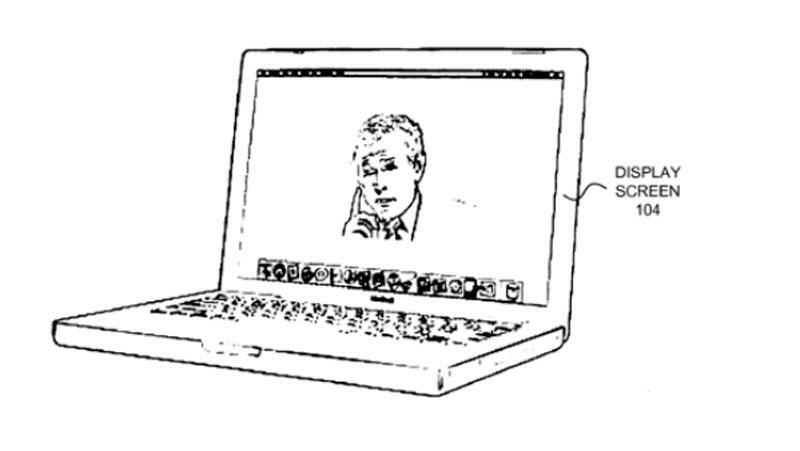 The filing explains how today's built-in cameras require a user to look away from the lens in order to see his or her video conferencing participants. "Constantly looking back and forth between the display screen and the camera ... can be distracting and make the conversation seem awkward and unnatural." This would appear to improve upon a similar June 2004 filing that involved many tiny image sensors wedged between LCD cells, and software to stitch together all of the smaller pieces. In an image attached to the application, a cross-section diagram illustrates a focused "image-capturing mechanism" aimed at a user through the screen. Another presents a MacBook with no iSight lens on the top bezel (and apparently being used by a President Bush lookalike). While rumors have already circulated for some time of what might best be called "iChat AV Mobile" for the iPhone, this proposed patent seems to confirm the very real possibility of such a feature for the iPhone, iPod touch, and even other devices. "The display screen is coupled to a laptop computer, a desktop computer, a cellular phone, a personal digital assistant (PDA), an electronic organizer, a media player, an advertisement-generation mechanism, a security mechanism, an automated teller machine (ATM), an instrument console or control panel, or another electronic device." Other recently published Apple patent filings include one for an improved laptop display housing that integrates the familiar illuminated Apple logo behind the screen. Another describes a stiffening plate for a laptop's palm rest that would help save weight by making it possible, for example, to replace heavily metal-reinforced Superdrive housings with aluminum housings. Apple has also devised a way to simplify the architecture within its iPhone and iPod touch devices, which currently need three chips just to interpret the touch sensor. A new single chip design would be better equipped to lessen electrical interference and further improve touch screen response. One last filing seeks to improve the efficiency and consistency of LED-lit displays.